IBM® WebSphere eXtreme Scale provides a powerful, elastic, high-performance solution for scalability issues through caching and grid technology. 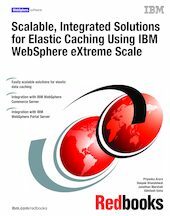 This IBM Redbooks® publication shows architects and IT personnel how to leverage the power of WebSphere eXtreme Scale technology to enhance data caching performance in their enterprise networks. This book discusses the scalability challenges and solutions facing today’s dynamic business and IT environments. Topics discussed include existing scalability solutions, how WebSphere eXtreme Scale can be integrated into these solutions, and best practices for using WebSphere eXtreme Scale in different environments, including application data caching and database caching. Also included is an in-depth discussion of the WebSphere eXtreme Scale infrastructure, such as grid clients and servers, the grid catalog service, zone support, and scalability sizing considerations. This book focuses on the challenges and benefits of integrating WebSphere eXtreme Scale with other middleware products, including WebSphere® Business Events, WebSphere Commerce, WebSphere Portal, and Rational® Jazz™-based products. Detailed procedures for integrating, configuring, and monitoring WebSphere eXtreme Scale in WebSphere Portal and WebSphere Commerce environments are provided.